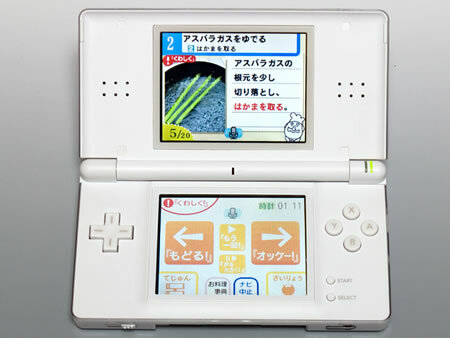 Other than playing Mario the Japanese can also learn cooking on their Nintendo DS thanks to the Nintendo DS Cooking Navigator which has receipes for over 200 Japanese delicacies. It is voice activated so once you select a receipe for every step there will be a voice prompt along with pictures. For eg – The DS will tell you “add oil to the pan” and once you say “ok” it will move to the next step, of course right now it supports Japanese only. 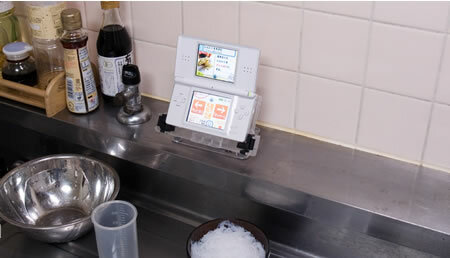 But would you use your precious DS Lite in the kitchen and put it in harms way. To the rescue is Play Stand made by Hori corp Japan which will hold your DS firmly. You can also adjust the height and tilt it according to your convinience. The Play Stand for DS Lite is available in Japan for 1,554 Yen ($ 15). It is a matter of time when we can have the Nintendo DS Cooking Navigator supporting english with receipes for Pasta and Russian salad.